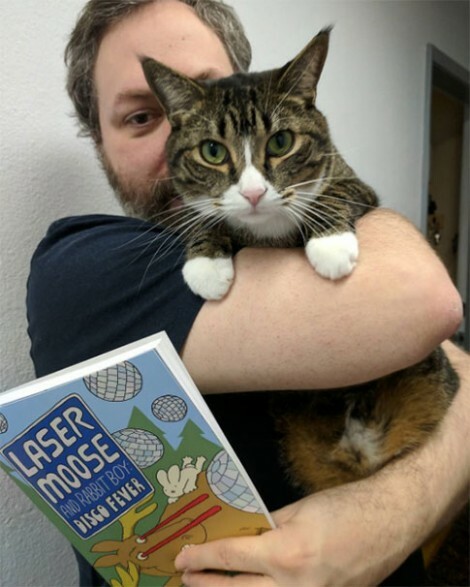 I tried to get Watson to endorse the new book. He gave it 4 out of 5 grumpy meows. I’m a special guest at this year’s Vancouver Fan Expo, alongside comics friends Ed Brisson, Simon Roy, Gisele Lagace, Dan Parent, and more! And the show features special guests from TV’s Arrow, The Flash, iZombie, and Degrassi Junior High among others. 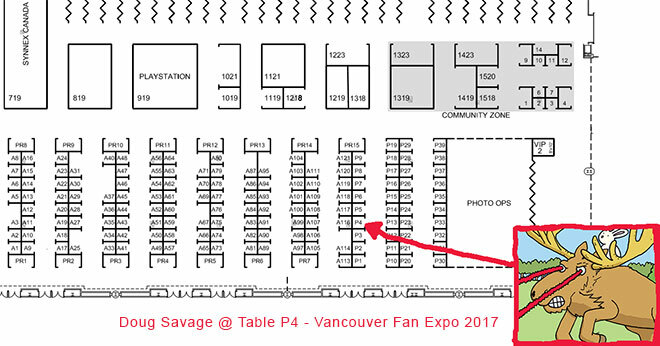 The show is from Nov 10-12 at the Vancouver Convention Centre at Canada Place, and I’ll be at Table P4 all weekend. Stop by and say Hi – and pick up a signed copy of Laser Moose and Rabbit Boy: Disco Fever! Here’s where I’ll be at Fan Expo this weekend. See you at Table P4! Can’t make it out this weekend? Then you can still get a signed book from me on Nov. 18. I’m having a little book launch celebration at the 12 Kings Pub here in Vancouver. Stop by, grab a book and a drink – and maybe even stick around for the Vancouver Comic Jam and we’ll draw some comics together! Here are the details on Facebook. ← First fan art for Disco Fever! I have finally learned not to get too excited every time I see you are going to be in Vancouver, because I live near the other Vancouver. It would be wonderful if you made the treck south to Portland, OR. From a big chicken fan.